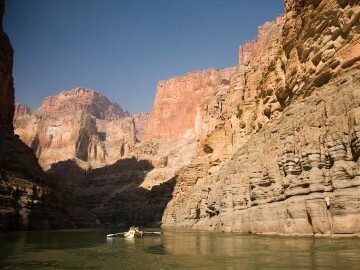 For a truly exceptional boating experience, a dory boat trip through Grand Canyon on Arizona’s Colorado River provides a unique and exciting alternative to an inflatable raft. 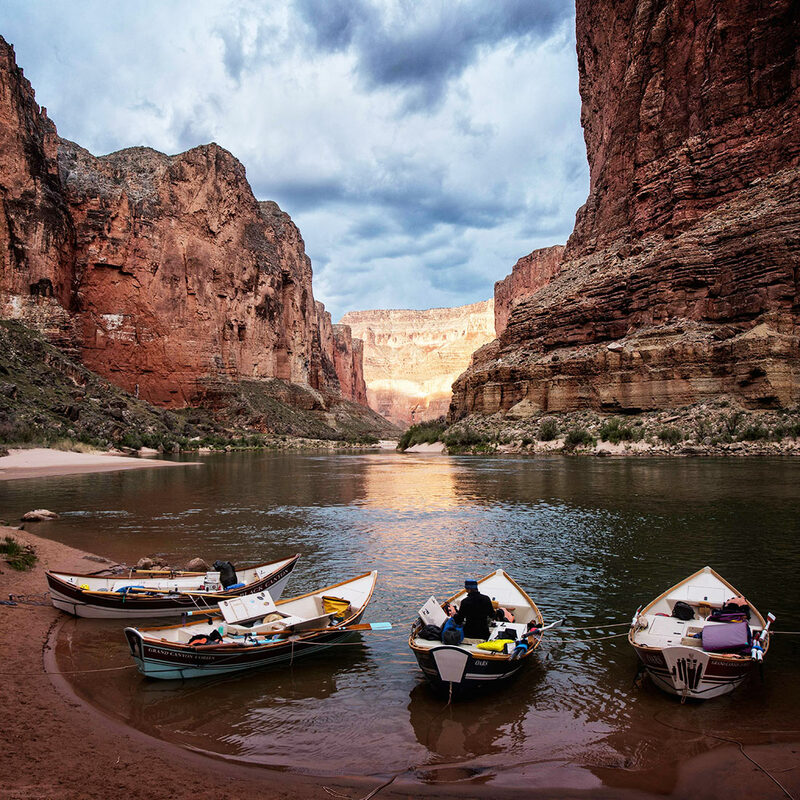 Grand Canyon Dories are small, traditional and charmingly elegant, rigid boats designed to carry four people and a tremendous amount of gear. At 16′ 9″ stern to bow, with six hatches, passenger benches and hardwood rails and trim, dories are able to run a river much more quickly than a raft. 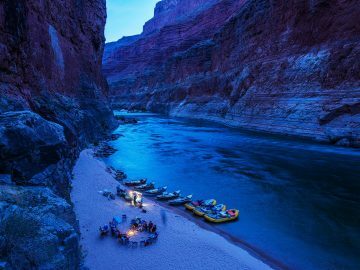 However, a Grand Canyon dory boat trip is not about speed, but about your own intimate, some might say organic experience of the river. As in life, the point is not whether you’ve just been to a place, but how you experience it once you get there. 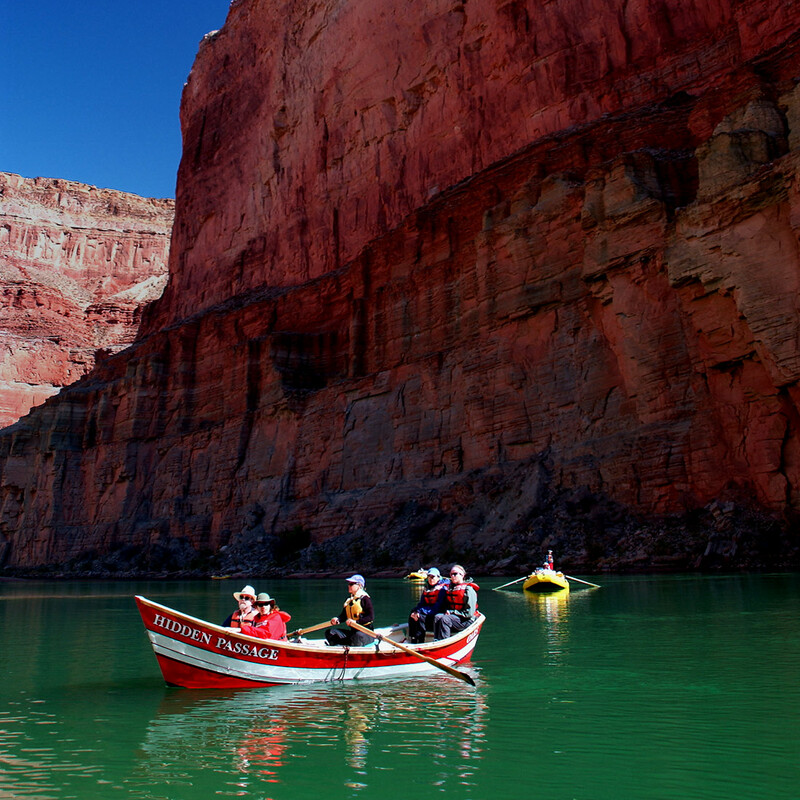 With a high crew-to-passenger ratio, our Grand Canyon dory trips provide better access to a more relaxed and energetic crew while they provide you with a quality of service unmatched in the industry. 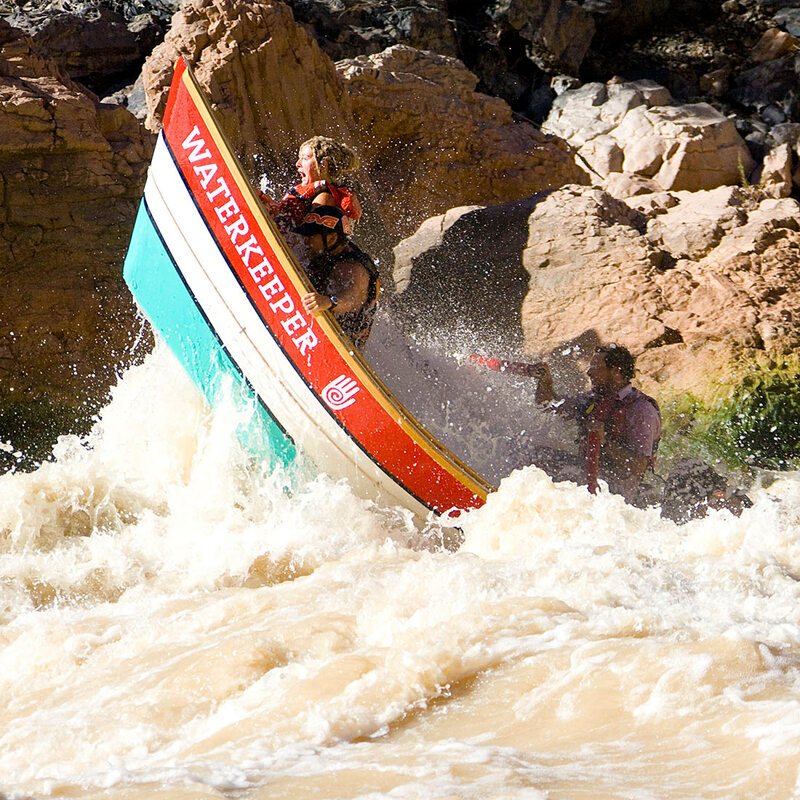 We pay respect to Arizona’s Colorado River, its surrounding environment and your river experience by setting a slower, more relaxed pace without sacrificing the thrill and excitement of your whitewater adventure in Grand Canyon. 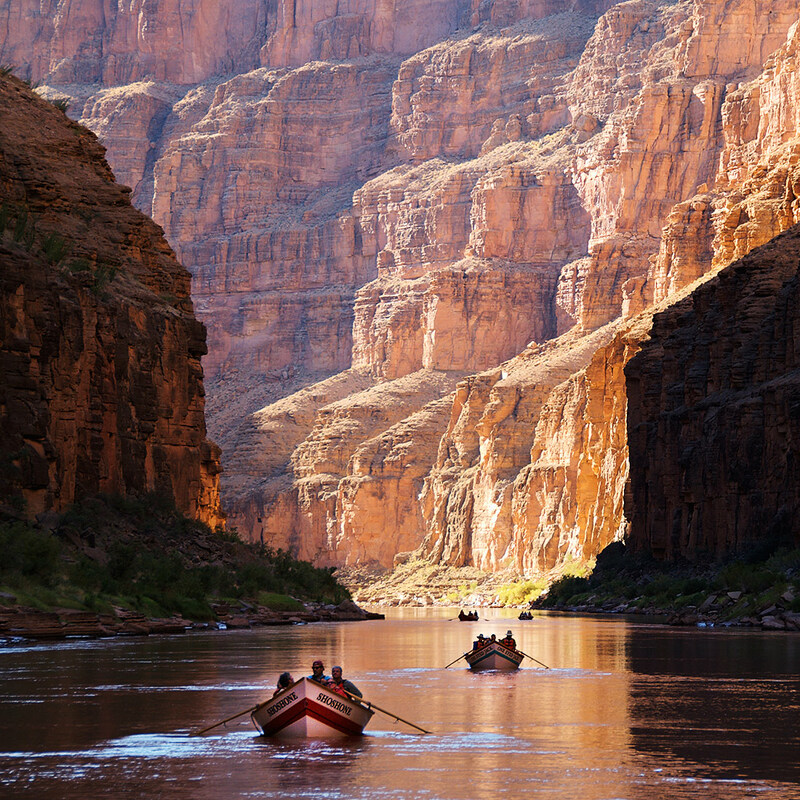 With professional guides born to row and boats designed with every consideration in mind, your only concern will be taking in the amazing scenery that sets the background for your truly fantastic Grand Canyon river trip. The evolution of the dory experience has long been in the hands of the boatmen, many of whom have been a part of it for over thirty years. It is their professionalism, their creativity and above all their dedication to doing it right, that make a dory trip the sincerely unique and spectacular experience that it is. So whether you’re a veteran river runner or a curious novice, let our staff and our guides assist you in creating your own personalized dory boat adventure. 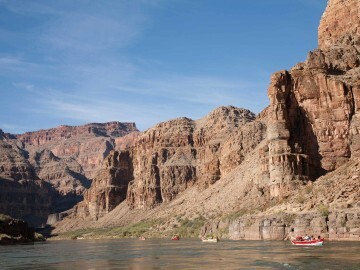 Let’s start back in 1869, when Major John Wesley Powell first explored the uncharted canyons of the Colorado. 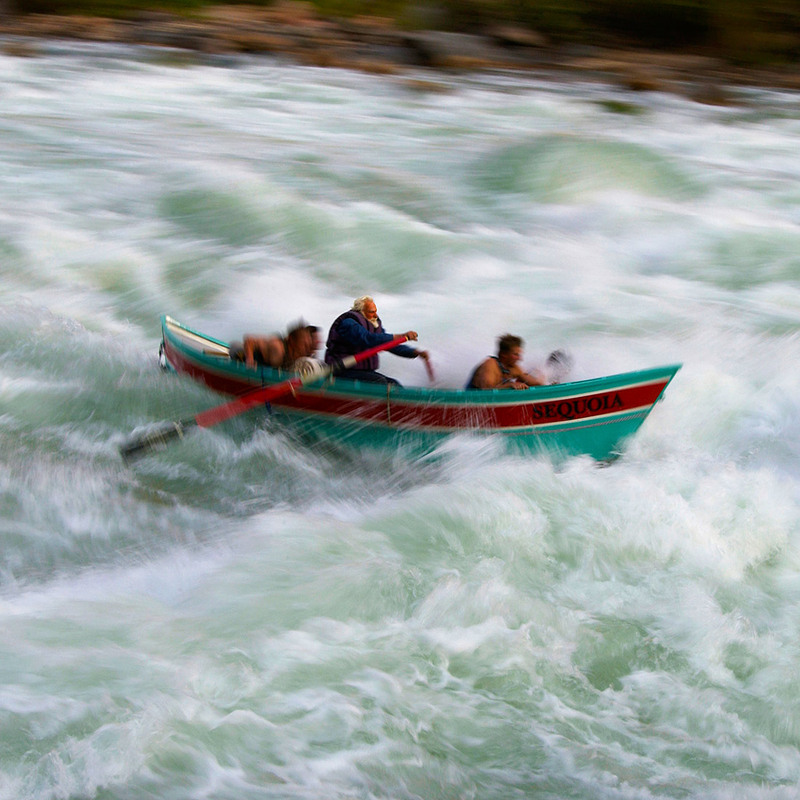 The art of whitewater rowing had yet to be born and Powell’s boats bore little resemblance to dories. His were keeled cutwater boats with two men rowing hard downstream. Another man in the back attempted to steer with a long sweep oar. 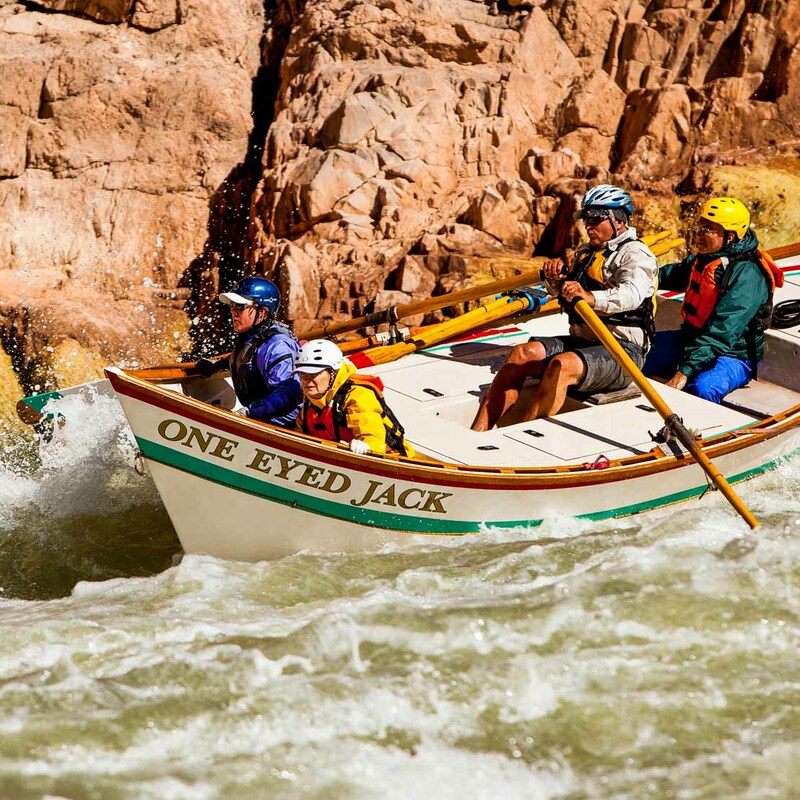 With bravery, luck, persistence and much portaging, Powell and the expeditions that followed him were able to navigate the Colorado in these heavy, unwieldy boats. In the 1890’s, a Utah trapper named Nathaniel Galloway revolutionized whitewater boating. By going to a light, flat bottomed boat and rowing upstream, against the current, to increase maneuverability, Galloway was able to navigate rapids previously thought unrunnable. Both his style of boat and his stern-first rowing technique proved far more successful than Powell’s and predominated during the early part of the 20th century. In the late 1930’s, Norman Nevills took the next step by creating a far broader craft called a Cataract boat. 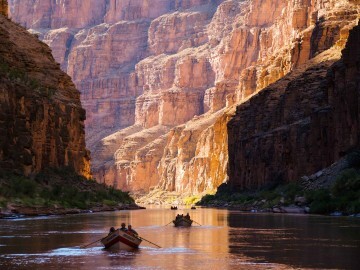 Rowing Galloway-style, he used these boats on the first commercial Grand Canyon river trip in 1938. 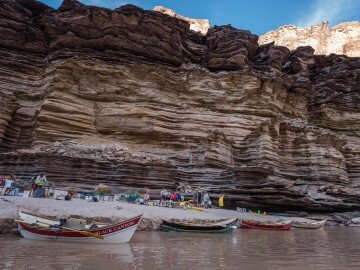 Though the Cataract boats were run in the Canyon for more than thirty years, their poor carrying capacity forced them to succumb to the new competition: inflatables. 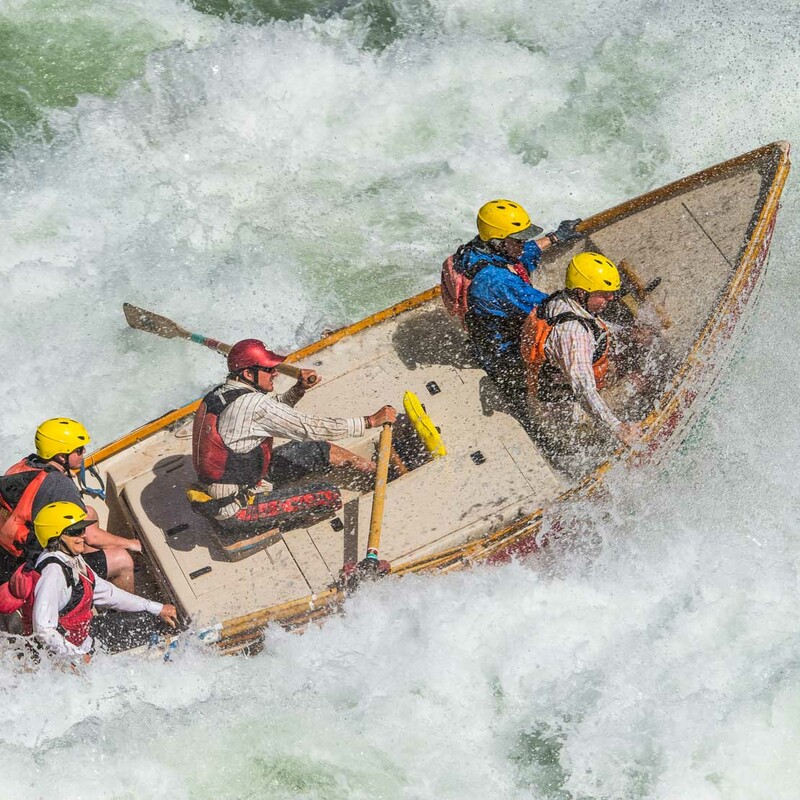 Introduced the same year as the Cataract boat, the raft was hard to argue with—it bounced off rocks, held more people and gear and rolled up into a bundle for easy transport. And with a motor on a huge raft, why you could take twenty people or more through the Canyon in a week! In the Pacific Northwest, the evolution of watercraft went a bit differently. From the time of Powell onward, the boat of choice on the Salmon River had been the old Mississippi River sweep scow. These gigantic wooden barges were guided down the river by one or two stout men using ponderous 28-foot sweep-oars, one on each end of the boat. By standing mid-ship and heaving on the huge sweeps, the men could pry the boat laterally in the current, snaking between the rocks. It was over in Oregon on the McKenzie River that the river dory began to evolve. In the 1920’s, Torkel Kaarhus, a Norwegian boat builder, began to modify the awkward flat plank boats then in use. He bent the ends up, giving the boats “rocker” and making them easier to spin. He raised the low square stern to help ward off the waves. A few years later, Woodie Hindman, who got his start with Kaarhus, began to modify the design. After running a trip on the Middle Fork of the Salmon River with its bigger rapids, he returned to Oregon determined to design a better whitewater dory. First, he converted the high square stern into a higher, pointed stern to better cut through the waves. Next, he squared off the low pointed bow to accommodate a motor. In a sense, he turned the boat around backwards. Lastly, he lengthened the boat for better handling. This became the McKenzie-style dory, or “drift boat,” which is now common on rivers throughout the Northwest. 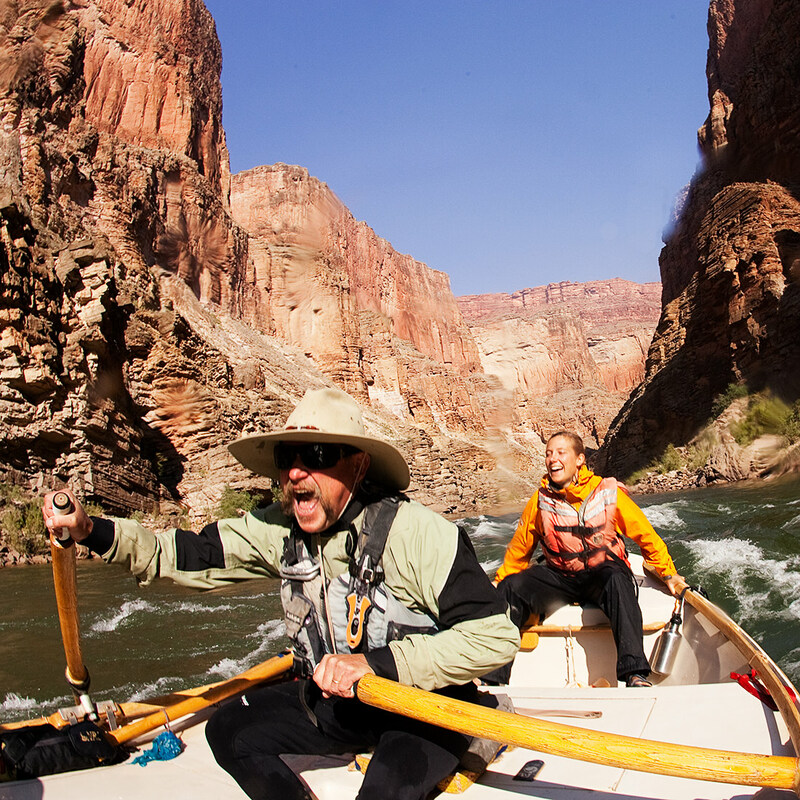 In the Grand Canyon of the 1960’s, two veteran rowers of the old Cataract boats, Martin Litton, and P.T. Reilly, saw the need for a more practical craft, but wanted to preserve the dignity and grace of the wooden boat. Why not the dory? They worked with boat builders Keith Steele, and later, Jerry Briggs, developing larger, decked-over versions of the McKenzie dory. They found them to be perfectly adapted to the rigors of Grand Canyon. Moreover, it could carry four passengers and, below the decks, plenty of gear. 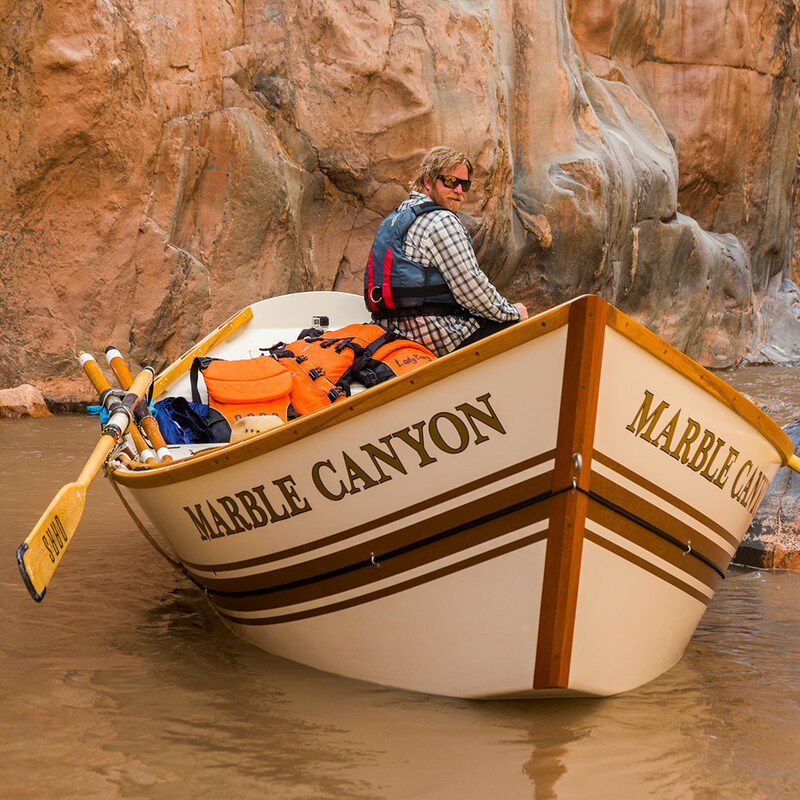 Early in the 1970’s, Martin Litton began rowing them commercially, founding Grand Canyon Dories. Before long he had brought them full circle, back to the Northwest on the rivers of Idaho. Only a dory can give you the subtle feel of the currents and a frisky ride in riffles that the inflatables wallow over; and then power up a wave the size of Nebraska and rocket off the crest in an explosion of glistening spray that leaves you impossibly, miraculously—occasionally—dry. On calm stretches they are floating lounge chairs, with everything you need easily accessible inside the hatches. In the rapids, all gear is stowed beneath and the decks are bare of extraneous debris—a streamlined bullet blasting through the waves. Aside from the incredible places these dory boats will take you; aside from the wonderful experiences you will have there; aside from the dories’ heritage and elegance; these boats, more than any other on the river, are just plain fun. 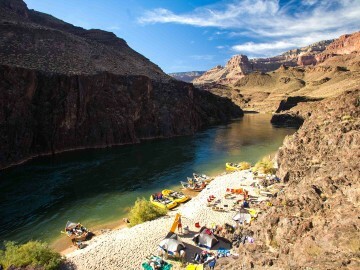 You can probably envision it already—the perfect Grand Canyon river trip: exciting rides in the rapids, a few good hikes and some first-rate photo opportunities, camping out and chowing down on some great outdoor cooking. You may have read about it on other websites. …noticing on day ten that Jim has finally taken off his watch and is sitting quietly by himself watching a lizard. …seeing Ed get to know, for the first time in his life, his teenage daughter, Mary Ann. …explaining to a wide-eyed, eager Barbara, who never cared beans about rocks, the mechanics of a thrust fault. 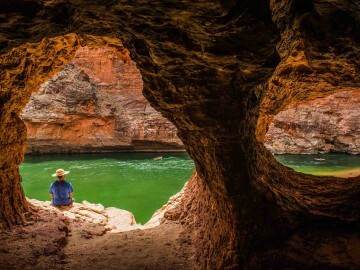 …seeing Mary’s beaming 84-year-old face after, with the aid of five boatmen, she made the tough climb into Travertine Grotto. …turning the oars over to fifteen-year-old Kathy, only to discover she must have been a boatman in a past life. …silently signaling the rest of the dories into the eddy to see a grazing family of bighorn sheep, the only sound the click, click, pok, bzdzik of a dozen cameras. …joining twenty people who should know better, running around in the pouring rain to get a better view of the dozen brick-red waterfalls exploding over the rim. …floating out of Lava Falls right-side-up one more time, water still spilling out over the gunwales, as four people who had been nervous as hell thirty seconds ago erupt into unchecked jubilation. …for the ninth time that late October night, though no one’s spoken for nearly an hour, putting one more log on the fire. What we’re offering, really, isn’t so much a trip as an experience. To most folks, the scenery, the thrills and the camp life are only a part of it. The rest of it comes from within. We’ve found the rule to be, without exception, that however much you want to put into these places, that’s how much you’ll get back. And then some. O.A.R.S. 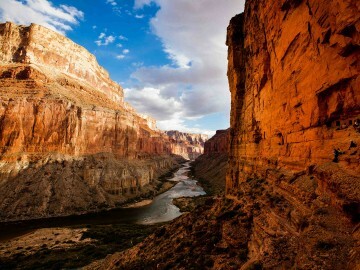 Grand Canyon, Inc. is an authorized concessioner of Grand Canyon National Park.